A purple girl adorned with rainbows is really getting around these days. She travels to show support for LGBTQ (lesbian, gay, bi-sexual, transgender, and questioning) young people. She’s been spotted in Australia, Poland, and in Maryland for the signing of the Civil Marriage Protection Act. If her Facebook page is any indicator, she also hangs out with TV stars. 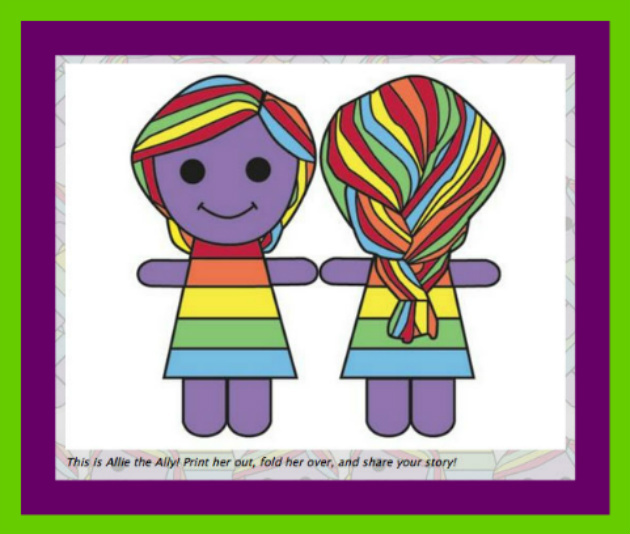 Allie the Ally is a paper doll created by Silver Spring, Maryland students at James Hubert Blake High School who are members of a Gay-Straight Alliance club called Allies 4 Equality. Their efforts to promote understanding and acceptance netted them the first Gay-Straight Alliance of the Year Award presented by The Gay, Lesbian & Straight Education Network (GLSEN). These high schoolers encourage all of us to print out a copy of Allie, take a picture with her, then submit it along with a message. That might be something we’d like to tell youth who are struggling with self-acceptance or our comments about why LGBTQ awareness is important. Our words and images will show people all over the world the level of support available for LGBTQ youth. Post images on Allie’s Facebook page and connect with Allie on Twitter. And imagine the day when copies of Allie the Ally are faded displays in a Civil Rights museum, no longer needed in a world where each person is valued as a uniquely beautiful being.